I love how it turned out, though, and with the stripes and boat neck it is particularly flattering for us breastally-challenged gals. I think "sweaters for the breastally challenged" might end up being my garment niche. Work with what you (don't) got, I always say. Anyway, let's do a walk-through, shall we? Click the name or pics to check it out on Ravelry. 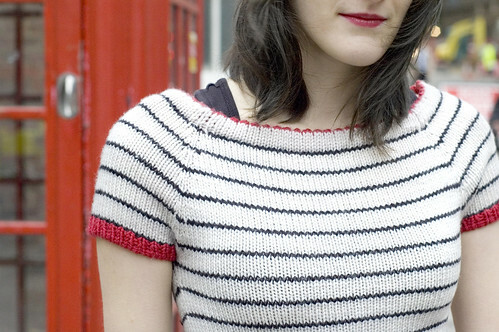 Boat neck, stripes, contrast hems, picots! Easy top-down raglan shaping and a bit of nip-in at the waist. Ever so slightly saucy, I'd say. 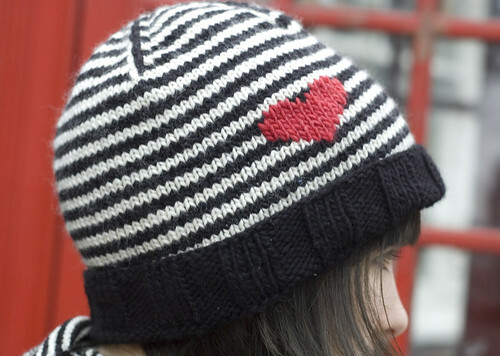 Wear your heart on your hat ;-) Stripes, slipped stitch decreases (my new favorite effect), and just a little duplicate stitch. True to their name, these babies kept my paws cozy in the freezing drizzle at Borough Market (which is also where these photos were shot. Do I look cold in the pictures? BECAUSE I WAS. VERY.) 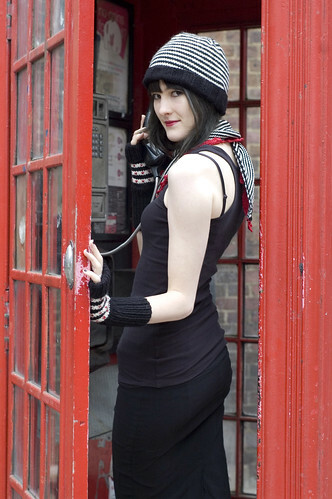 The finger-side-cuff can fold back for dexterity or forward to keep 'em warm, it's very useful. Plus, little tiny hearts! 'Cuz Valentines!! This might be the sweetheart of the collection- I absolutely love this shawl (and it looks divine with my new red coat!) Stripes, slipped stitches, scallops, picots! I knew right away what I'd name these guys, hehe ("Zebra crossings" are pretty much just British crosswalks...sometimes they have some zig-zag lines. Way funner name, if you ask me.) The pompoms and sassy contrast back "seam" make me very happy. Hooray, you're so brave! And dammit, I wanted to name a pattern 'Zebra Crossing' (as soon as I read yours, that is. What an obvious and unfreakinbelievably great name). Congrats! its an awesome collection - love your photos! Wow that is a stunning collection! I love them! Great job Alex, and especially on your sweater! Super cute! You look great in all of the shots. And that top is sure cute. FABULOUS collection, and congrats on publishing your first garment pattern! It's a great design! And I promise it gets easier. But hey, what's black and white and red all over? Gorgeous collection Alex. Well done! And congratulations on your first garment! Woot! Yeah we boring Americans just call them "crosswalks" :-P Zebras are much better.